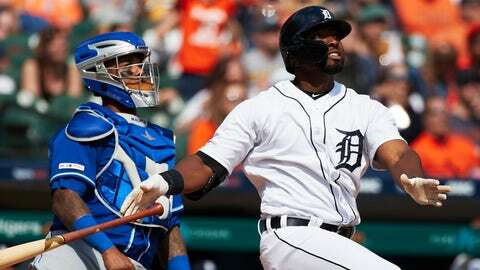 Christin Stewart hit a grand slam in the seventh inning to give the Tigers a 7-4 lead over the Royals. DETROIT — This was the type of win that Detroit fans can be encouraged by — not only did the Tigers rally in the late innings, but one of their top young players delivered the key home run. Kevin McCarthy (0-1) allowed three hits and a hit batter. The only out on his watch came with the score 4-3, when Alex Gordon threw Josh Harrison out at the plate. Detroit eventually loaded the bases with two out, and Stewart hit a drive down the line in right field off Wily Peralta.